I am well aware that very few readers in Pittsburgh would even skim through an article about the 2007 NBA Draft. Said readers are even less likely to peruse any prose regarding the in-progress English tradition that tennis fans like myself know as Wimbledon. I desperately want to talk about tonight’s NBA Draft or today’s matches at Wimbledon, but I will yield to the masses and not subject you to such topics…not directly, at least. To get my fix, however, I have envisioned a Mock Draft of my own. Few Pittsburghers care about the NBA…perhaps even fewer care about Wimbledon…but what if I envisioned a world in which NBA teams picked tennis players to best fit their team’s needs? Stupid? Genius? Ridiculous? The best way for me to avoid writing an article about the Pirates on a slow summer day? I say all of the above. Join the insanity and let me get my fuzzy-ball fix after the jump. The Blazers waste no time in sending a shockwave through the Draft room by going with Courier first over all. No Sampras? Nadal? Federer? But Portland fans inherently understand the pick: ever since Walton left, the city has been desperate for a lovable redheaded figure to serve as the poster child of the city. The door appeared to be open for the Hawks - the first two picks went with personality compatibility over talent. But the Hawks instead stick with the rankings. With the third pick, they figure they might as well take the third ranked player in the world, A-Rod. He is a perfect fit for the Hawks drafting strategy: pick athletically gifted players in the first round who stand a minimal chance of actually reaching their potential (see: Josh Smith, Josh Childress, Marvin Williams, Shelden Williams). A terrible pick to be sure, but Roddick makes perfect sense in the far off corner of the universe occupied by the Atlanta Hawks. “Yeah I was walkin’ in Memphis, I was walkin with my feet ten feet off of Beale”. Pete can walk (jump) ten feet off anything. This pick is made purely so my friends in Boston will cringe. Here is hoping you all take Yi Jianlin with the 5th pick tonight. Besides, after the Red Sox striking gold with Dice-K, I think it is only fair, karmatically and Orientally speaking, that Yi sinks the Celtics franchise. Finally, Fed-X is called up the podium. This is a perfect fit. Roger is quiet, Milwaukee is quiet. Roger is peaceful, Milwaukee is peaceful. Wisconsin is known for cheese, Switzerland is known for cheese. I am not seeing any problems here. Andy Murray is from the British Isles. Luol Deng is from the British Isles. Sounds good to me. 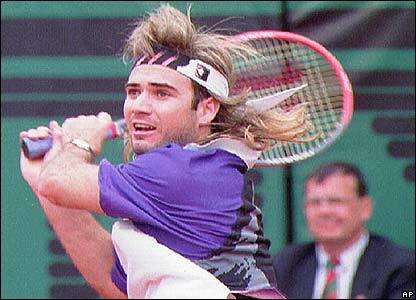 Never pass up an oppurtunity for an old-school Agassi picture. The Bald One comes off the board! The reason? As a Las Vegas native, he will be instrumental in putting fans in the seats for the Las Vegas Kings once they leave Sacramento. Marat after being told he is a Hawk. Whaddya know, another outrageously talented player who will (and already has) fallen far short of his projected accomplishments. And a big guy to boot, just like all the others! Yes, the Atlanta Hawks certainly deserve commendation for their ability to construct a draft plan and stick to it for several years…without taking into account the dynamic of their team…or any of their needs…or anyone under 6’5’’ in the draft. Philly fans are notoriously brutal, with controversial figures almost always garnering ridicule in the city of brotherly love. 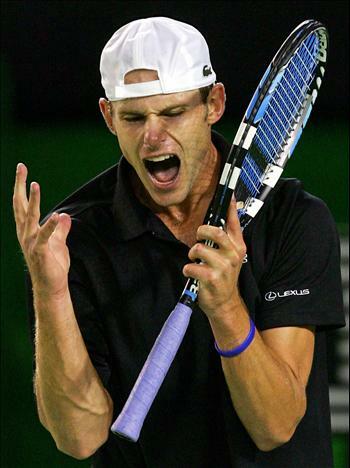 Hewitt is hated by many for his constant Aussie screaming, his nearly ground-thumping fist pump, (known to many in the tennis world as the “lawn mower”), and the almost inexplicable thing he does where he, I dunno, turns his fist into a snake’s head and stares it down (pictured above). Should be a fun marriage between the two. Should have kept the dreads, James. If I can pick one athlete, all sports included, to go into the city of New Orleans and serve as a beacon of hope for the rebuilding process, it would be James Blake. He overcame scoliosis as a kid, made the pro tour, broke his neck and developed shingles that paralyzed his face, watched his father die from stomach cancer, thought he’d never play again, and now is back in the top ten in the world. The guy is a miracle man. Yes, the injection went fine, thank you! 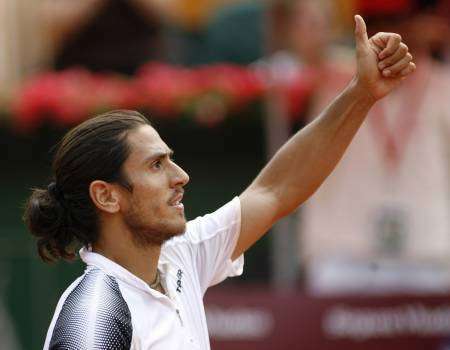 Canas, who has beaten Federer twice this year, has also been suspended by the ATP for drug use. How long is the drive from L.A. to Tijuana? I was nearly crying at that dunking Sampras picture at the top. Well done. U ROCK , man !